I am in a beautiful old Breton city on the edge of the English Channel tonight. It is called Roscoff. If you ever have a chance to come here, I promise you’ll love it. I’m here because tomorrow morning I’ll take a ferry from here to Plymouth England. Many of you wrote to me today asking if I am safe. I am far from harm. I appreciate your thoughts and concern. I turned on the TV about 9:00 this morning (4:00 a.m. for those of you in the East) and have been following the terrible news out of Brussels all day. Is there an answer to terrorism when young people are willing to strap a bomb on themselves and die? I have many beautiful pictures taken today to share with you, but this isn’t the day for that. Peace! I’ve had a good two weeks in this fine old city. It has a plentitude of the things I enjoy most when I travel: surprises around every corner, ancient places, great art, good food at low prices, nice people (and the bonus — these people all speak English!). I would recommend time here to anyone looking for those same qualities in a destination. I would probably not recommend doing it in January, but that was the only time it fit into my schedule and the weather wasn’t so bad on most days. 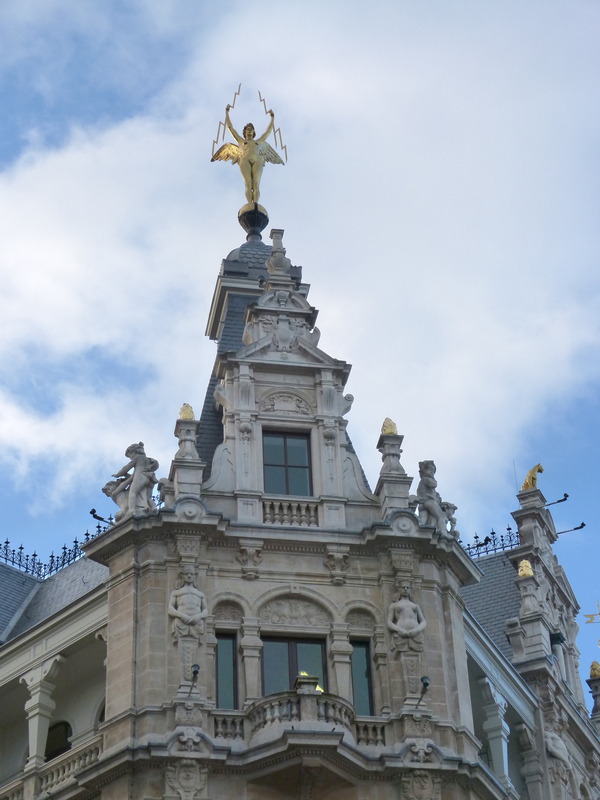 Antwerp has a long history with many ups and downs. The visitor enjoys the artifacts of the good years: the medieval cathedral, the 17th century when it was a center of trade in Europe, the late 1800s when ornate buildings popped up along the Meir, and apparently now. Building is going on everywhere now. Shopping in Antwerp is excellent, including many the big name international retailers and famous couturiers such as Channel. The city is filled with restaurants and I found their prices to be much lower than comparable prices in the U.S. restaurants. 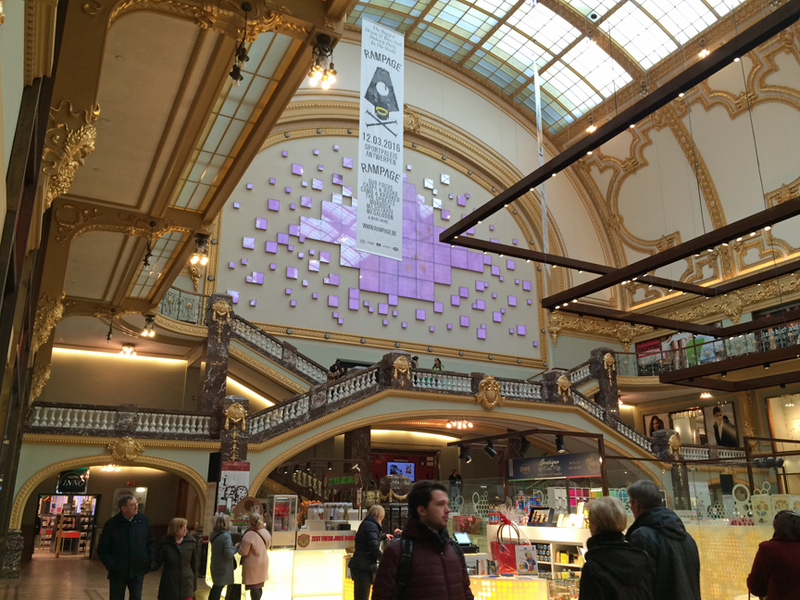 Yesterday I discovered another big and glorious surprise: a beautiful turn-of-the-20th-century building turned into a fashionable shopping mall, right in the center of the city. 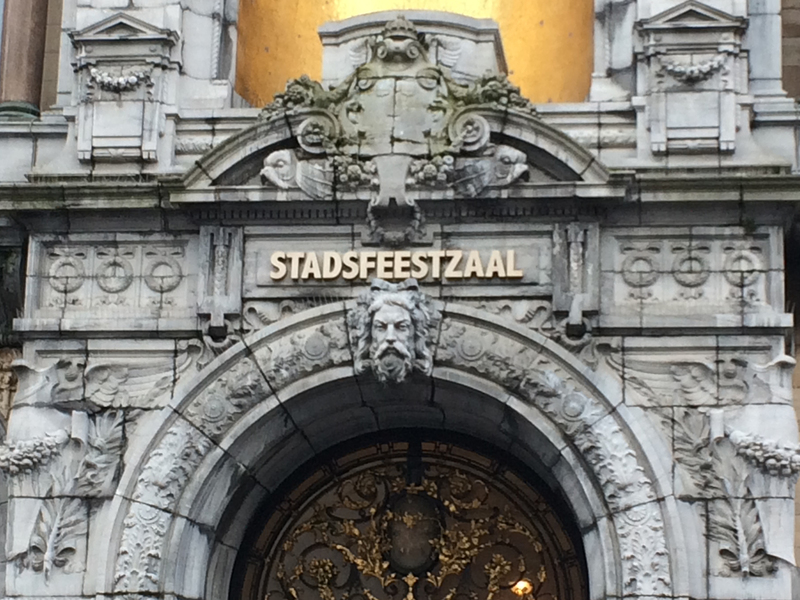 It’s called Stadsfeestzaal. In Dutch Wikipedia tells me it was built in 1908 and that the mall was developed in 2004-07. I’ll show you rather than tell you this beautiful old space that’s been recycled for the 21st century. It was hard to capture the elegance of this magnificent old building which has been brought back to life using only the camera in my phone. I’ve mentioned before the ornate railroad station that serves the center city. 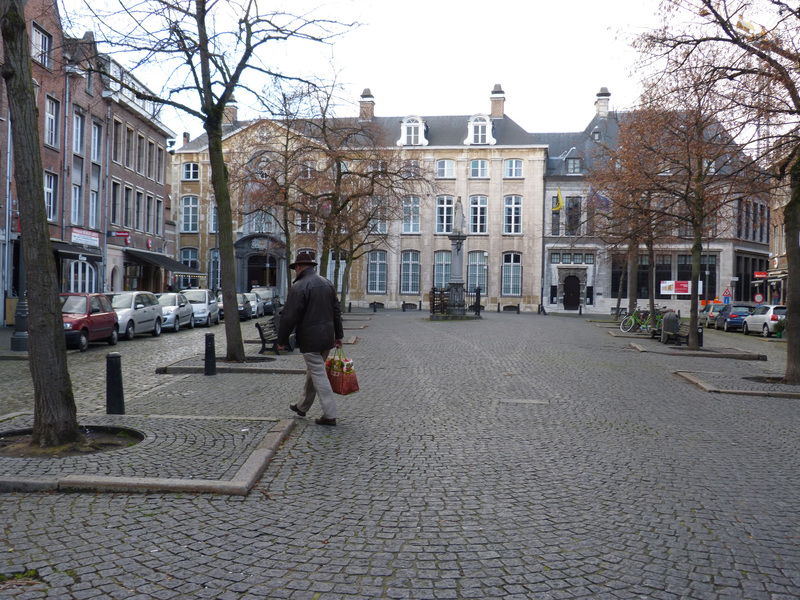 I went there yesterday to meet the caretaker for the apartment I rented in Antwerp. Gloria led me to an extraordinary café on the upper level that I’d failed to notice. She said the place had been closed for years and had only recently been restored and reopened. It was really lovely as the picture at the top of this post shows. 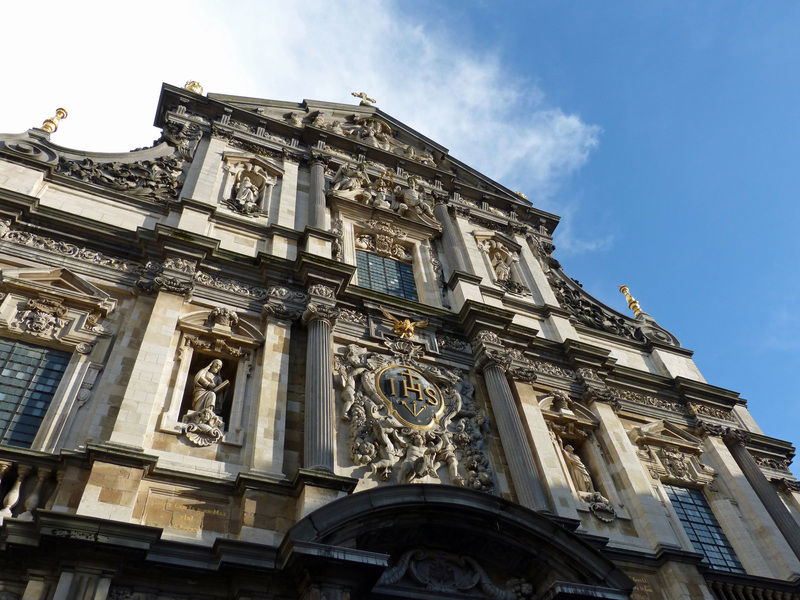 I’ve already told you how much I enjoyed the Mayer van der Bergh art museum, the Red Sail Line museum and the Plantin-Moretus museum as well as the stunning cathedral. I’ll just be a bit more practical here and mention that the part of Antwerp that tourists will want to visit is very walkable and also has an easy-to-use (but expensive) bus and tram system. (The tourist offices sell a ten-trip pass that lowers the cost o a ride more than 50%.) 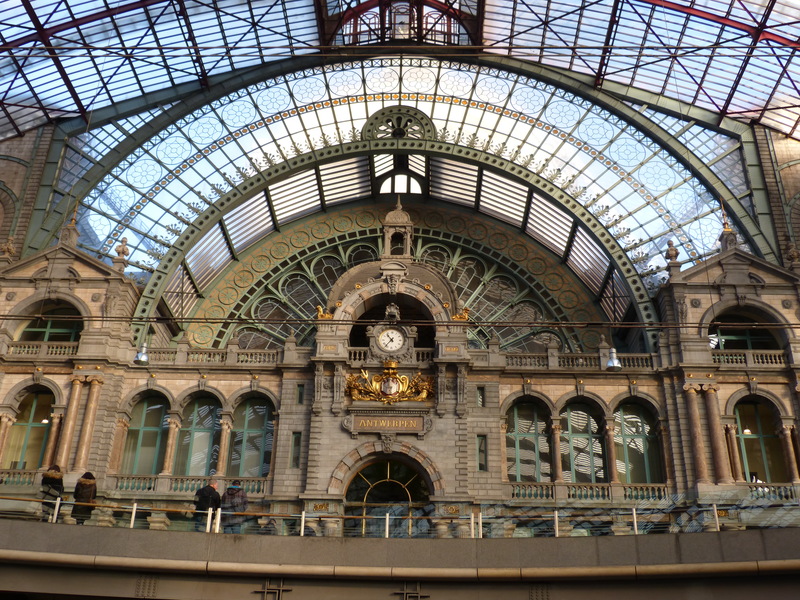 Antwerp is a good base for seeing much of Belgium and Holland — rail travel is easy (though not cheap) and the trains run on time. 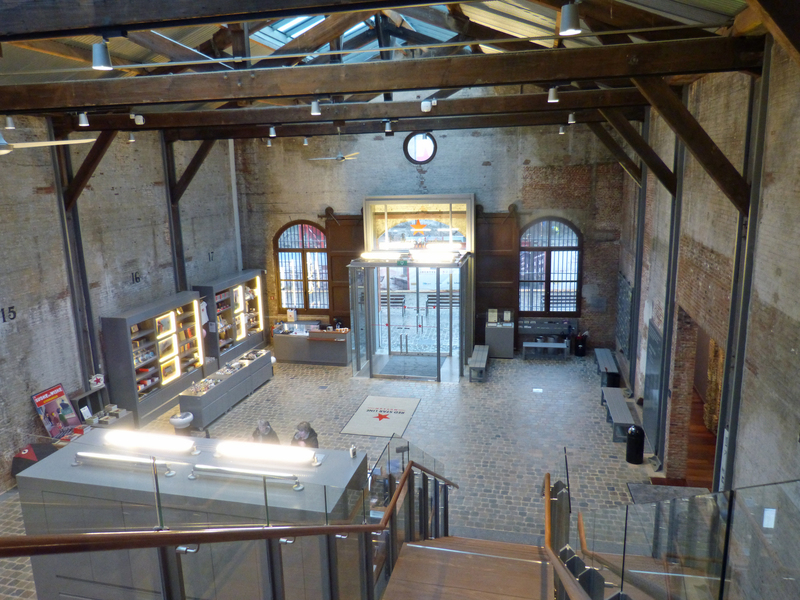 The main Tourist Info office and the TI in Central Station were very helpful and staffed by pleasant people; the museum pass was a good value. I have loved wandering the twisting old streets and finding ancient brick buildings around every corner. I hope I’ll have an opportunity to return to enjoy Antwerpen again. I’ve just completed an art-lover’s pig-out! 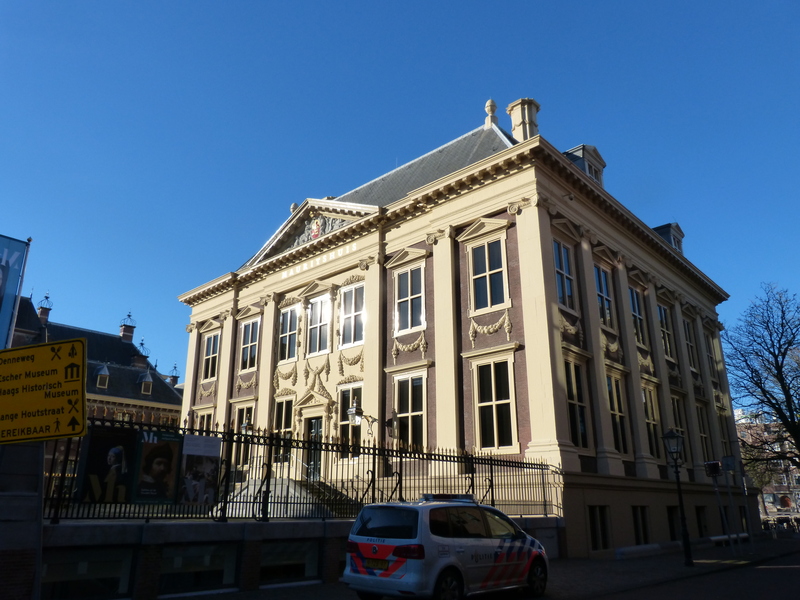 In two days I toured the greatest art of the Low Countries at three fantastic museums: Rijksmuseum and Van Gogh museums in Amsterdam and Mauritshuis in the Hague (real name: den Haag). I think I’m in sensory overload! My Sunday afternoon was spent at the Rijksmuseum. 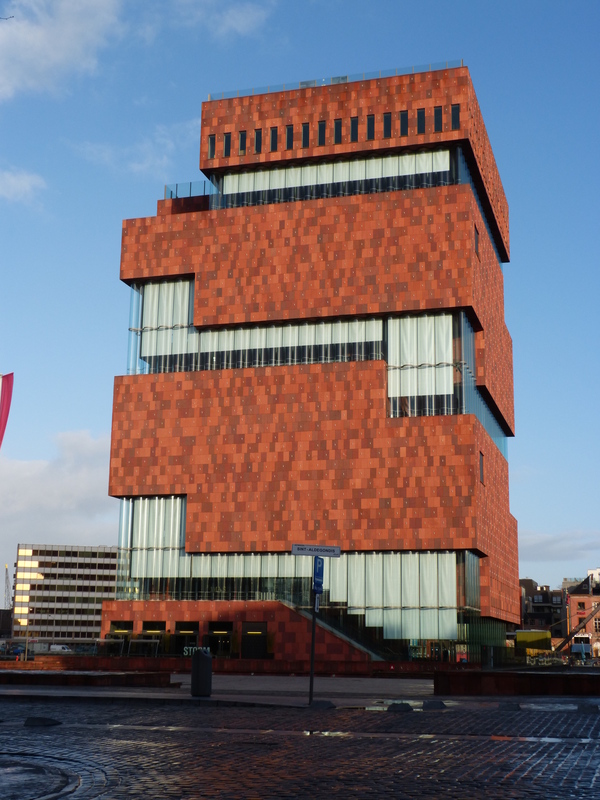 It’s one of the world’s great art museums, showing almost exclusively the works of Dutch artists. The building which dates from 1885 underwent extensive remodeling for about ten years before reopening in 2013. In front of the museum is a fun sculpture that proclaims “Iamsterdam” – it’s a favorite for tourist photos. The VanGogh museum was my morning destination. 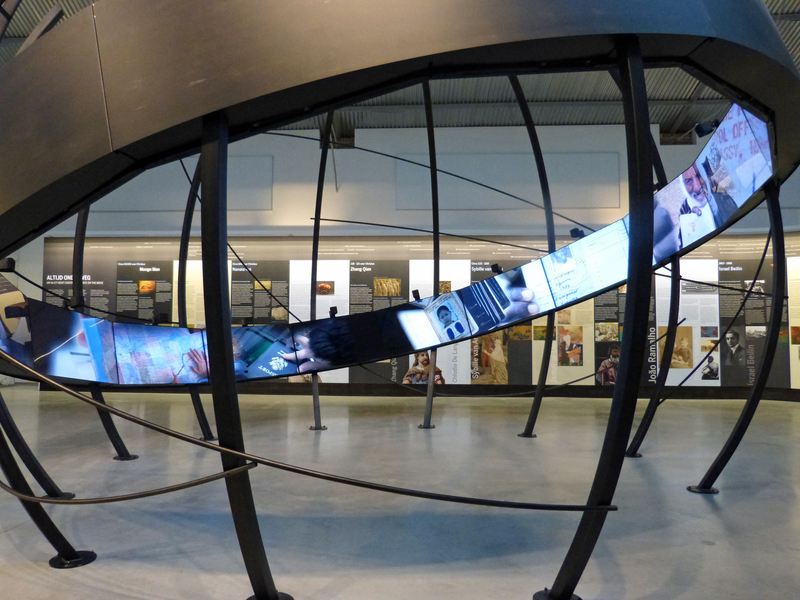 The museum tells the sad story of the life of Vincent Van Gogh who suffered from depression and ultimately committed suicide at the age of 37. He really only painted the pictures for which he is so well known in the last two years of his life. 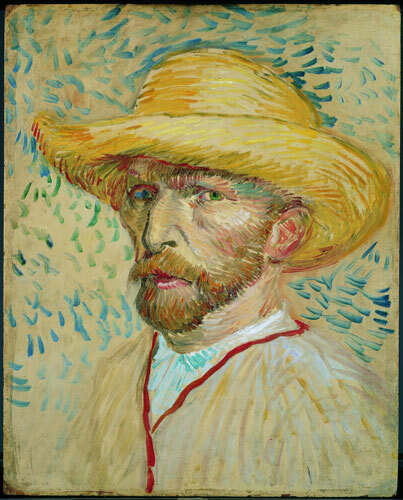 In his career, which lasted less than ten years, he created more than 2100 works of art and never sold one. 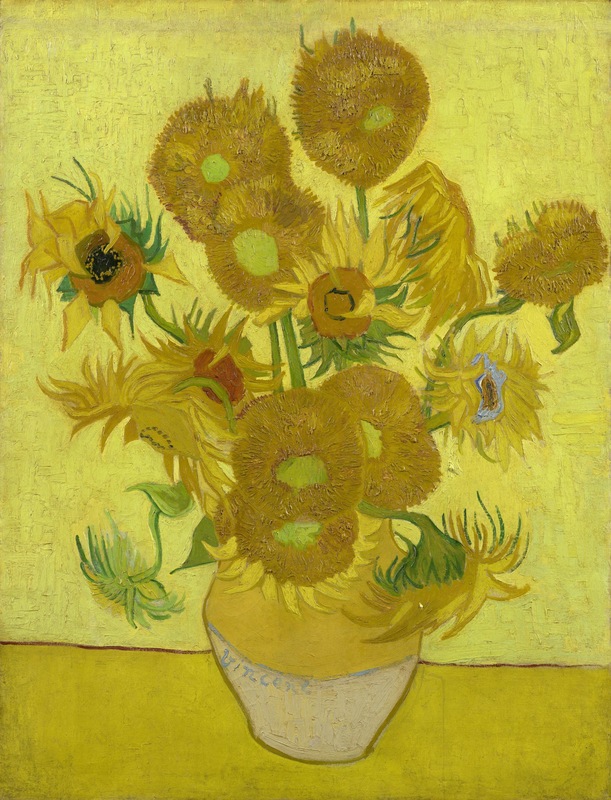 The museum features several self-portraits and a few of the more famous works, such as his sunflowers. 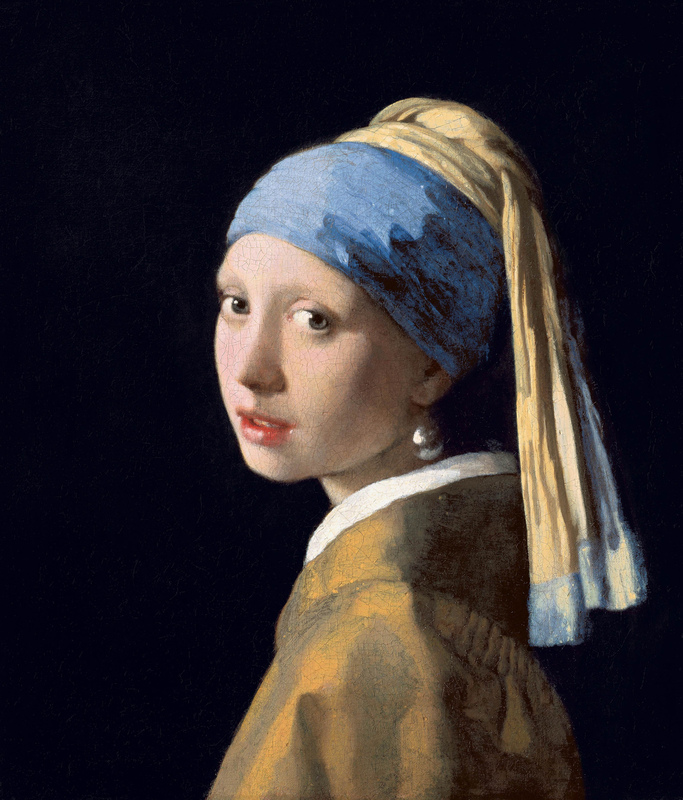 The “girl with the pearl earring” by Johannes Vermeer. 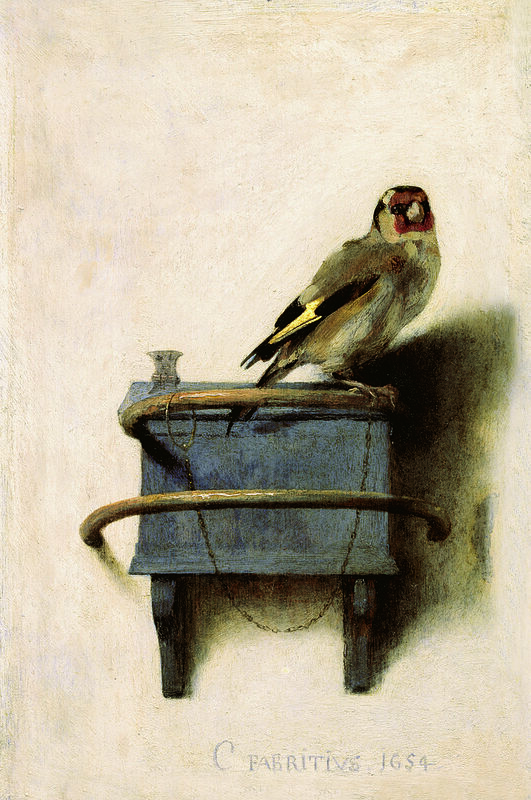 The “Goldfinch” by Carel Fabritus. I had an easy train ride “home.” Tomorrow I leave for Lisbon! Had a great couple of days in Amsterdam and the Hague. Just got in a short while ago. I’ll send news and pictures tomorrow. 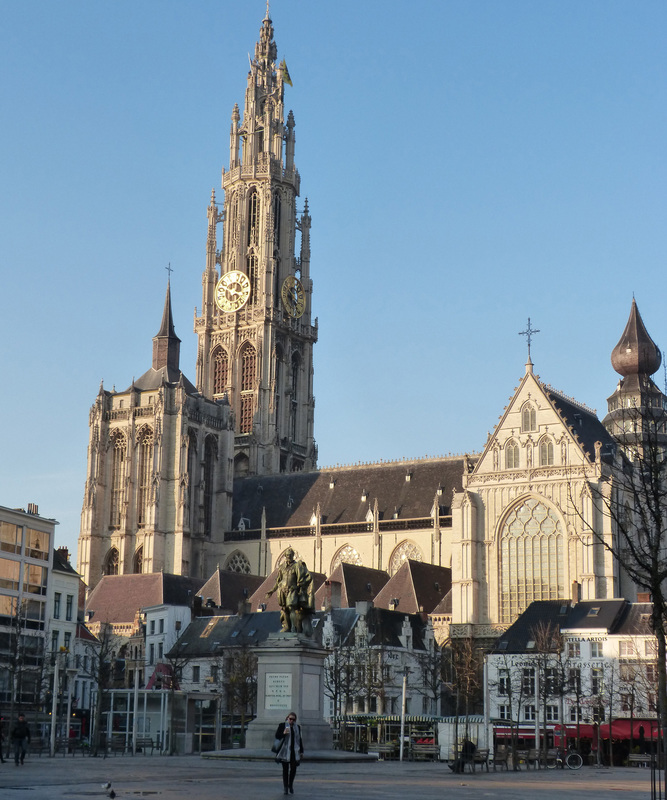 In the 1600s Antwerp was one of the richest and most important cities in Europe. Take a walk with me through its streets, seeing just a few of the many reminders of its glorious past. I like classical art and the centuries-old art of the Low Countries is my favorite. (The phrase “Low Countries” refers to Belgium, Holland and Luxembourg, which are together sometimes also referred to as BeNeLux.) This part of Europe has been a battleground frequently in centuries past. It has a long history of being controlled by other powers. The Spanish were here the longest (1579-1714) and perhaps had the most influence. It is the art created in what is now Belgium and Holland before and during the period of Spanish control that I like best. Unlike Italians who painted religious works to be displayed in churches, the Flemish artists of the Low Countries often painted the life around them. With almost photographic realism their art shows us the villages and neighbors of the artists – we see how our ancestors lived 500 years ago. And I like that. I’ve seen quite a lot of this art in the days I’ve spent in Antwerp. 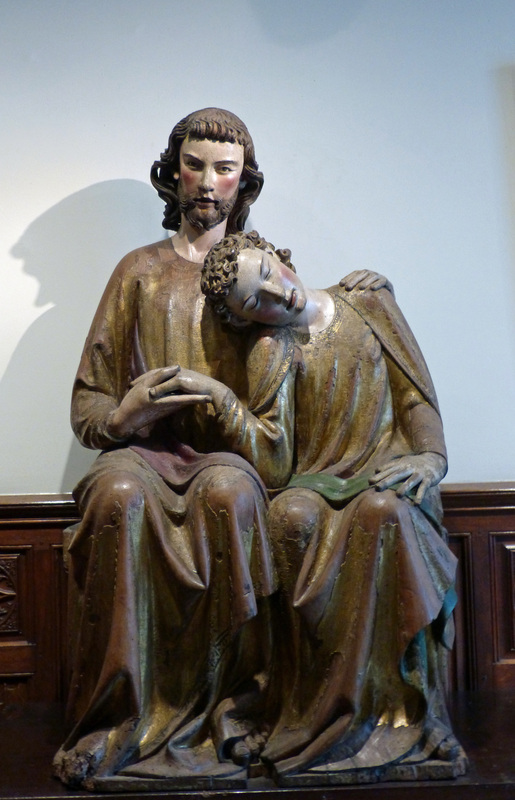 Yesterday I went to a small museum called Museum Mayer van der Bergh where I viewed an excellent collection of ancient Flemish art compiled by one man in the 1800s. 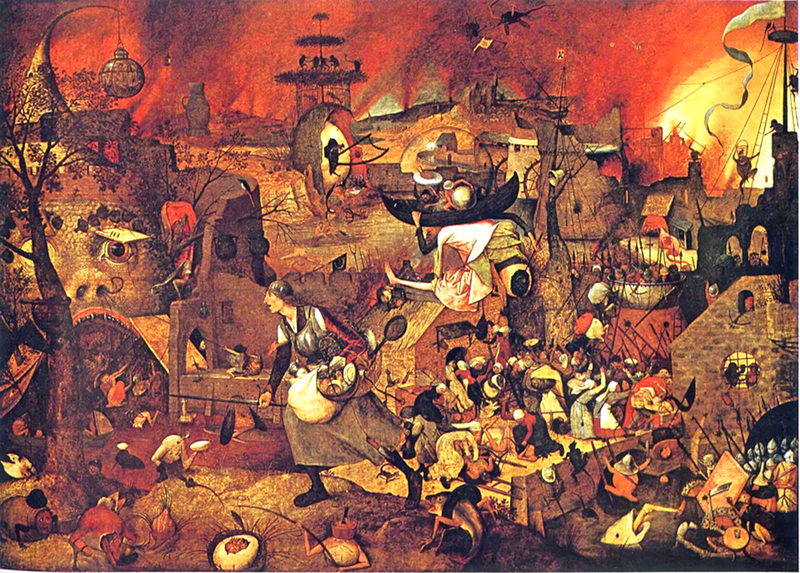 Probably the best known piece is Bruegel’s painting known as Dulle Griet – or in English as Mad Meg. From this point forward I’m quoting a Wikipedia article about this painting. “Griet was a disparaging name given to any bad-tempered, shrewish woman. Her mission refers to the Flemish proverb: She could plunder in front of hell and return unscathed. 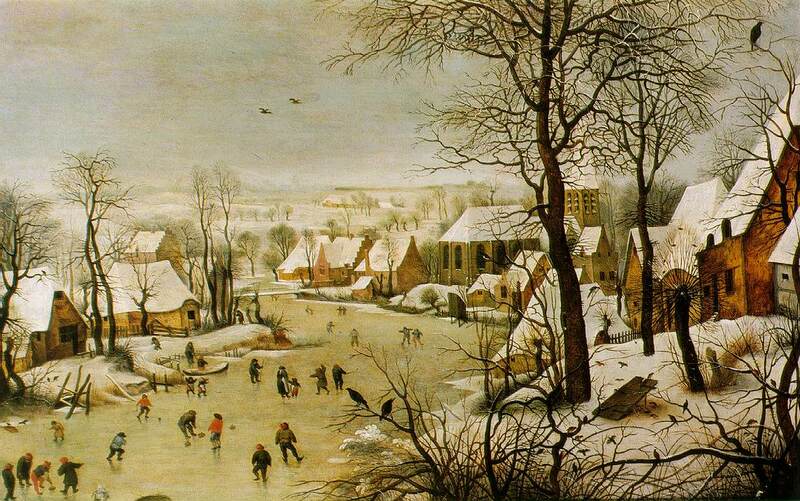 “Bruegel is thus making fun of noisy, aggressive women. At the same time he castigates the sin of covetousness: although already burdened down with possessions, Griet and her grotesque companions are prepared to storm the mouth of Hell itself in their search for more. Very strange, isn’t it? 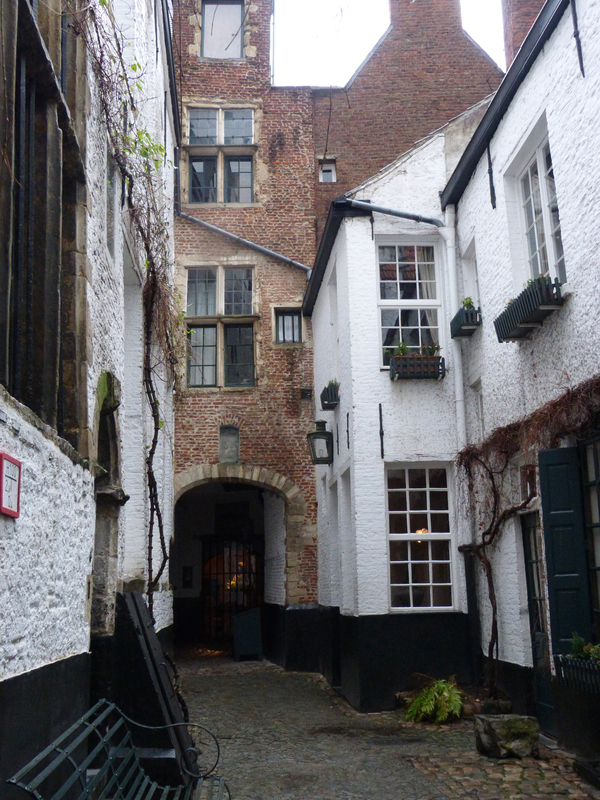 Want to see more of life in 16th century Belgium? Go to this site, from which I copied Mad Meg. How did we ever survive without the Internet? It occurs to me that some of you may like to hear a little about what my life is like here. I’m staying in an apartment that I arranged on AirBnB. Like many rentals at that site, it’s quite inexpensive – under $50 a day for a three room apartment with a large kitchen. (You can see it here: https://www.airbnb.com/rooms/6672914). It’s heated by lots of old radiators and so it’s kept me warm through several very cold days. Appliances are small and often rare in Europe. This apartment has the typical 3-foot-tall refrigerator but it also has a washing machine (!!!) which in theory also dries but hasn’t for me. Astrid, the landlady, recently added a dishwasher but it’s not connected yet and I really don’t need it. The apartment is in a building that probably dates from the mid-1800s (pictured above). My only concern/complaint is this: the apartment is on the third floor at the top of 48 very skimpy, narrow stairs. The apartment is in the part of town called “Eilandje” which is Dutch for “Island.” This is the old port district that’s in the process of being rehabilitated – a process that began around 1980, was probably slowed by the Great Recession, and is now in full bloom! There is construction everywhere around me, most of it on high-rise apartment buildings. 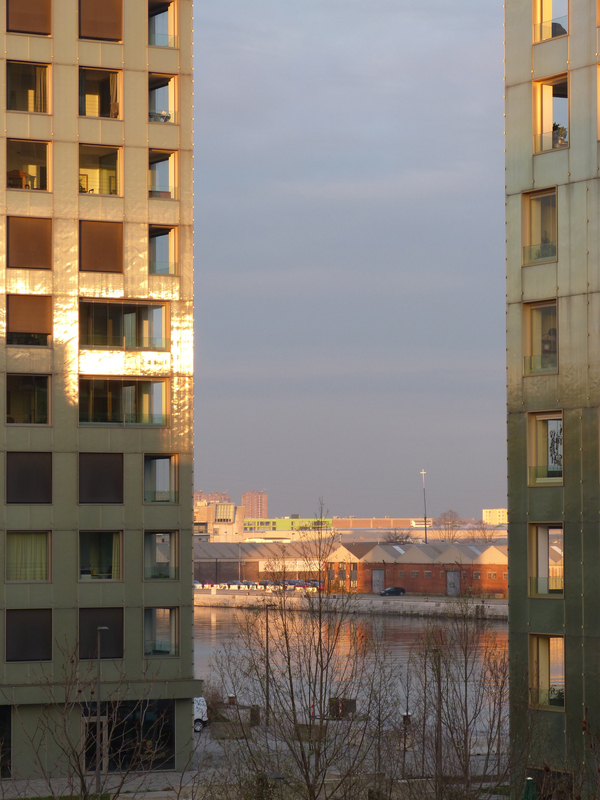 Yesterday afternoon the view over the bit of water visible from my kitchen was nice so I took the picture shown below. It also shows a bit of the pair of 15-story apartment buildings clad entirely in metal. Rather odd, I think. 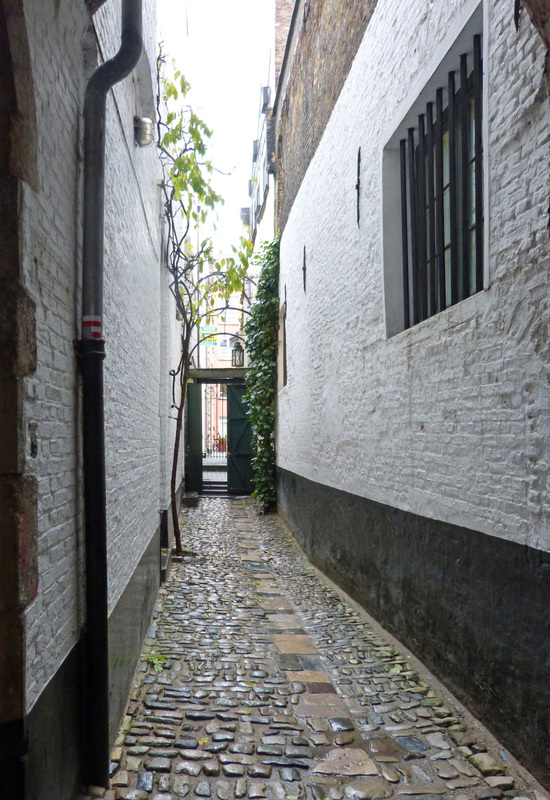 The “Eilandje” district is at the north end of old Antwerp, but it’s an easy walk of a mile or less to the center of the oldest part of town. Buses are nearby and take me to the train station or to the historic district. There are lots of small restaurants in this district. One I’ve dined at twice is just around the corner. It’s called “Den Hut” (which I think means “the hut” – Americanisms are everywhere in the local language). It’s “trendy” with mostly vegetarian dishes from a variety of nations. The young chef is very good and friendly and his food is fine. I especially like his shrimp & broccoli in Thai noodles. According to folklore the city got its name from a legend about a giant river. He exacted a toll from passing boatmen, and for those who refused, he severed one of their hands and threw it into the river. Eventually the giant was killed by a young hero named Silvius Brabo, who cut off the giant’s own hand and flung it into the river. Hence the name Antwerpen, from Dutch hand werpen, akin to Old English hand and wearpan (to throw), which has evolved to today’s warp. A longstanding theory is that the name originated in the Gallo-Roman period and comes from the Latin antverpia. 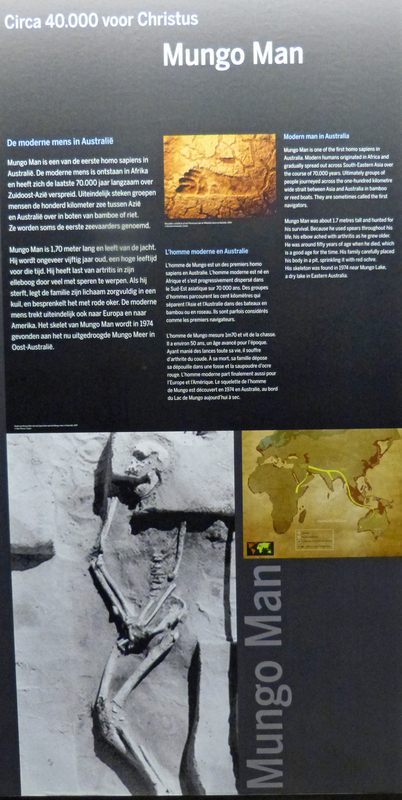 Note that the river Scheldt, before a transition period between 600 to 750, followed a different track. This must have coincided roughly with the current ringway south of the city, situating the city within a former curve of the river. 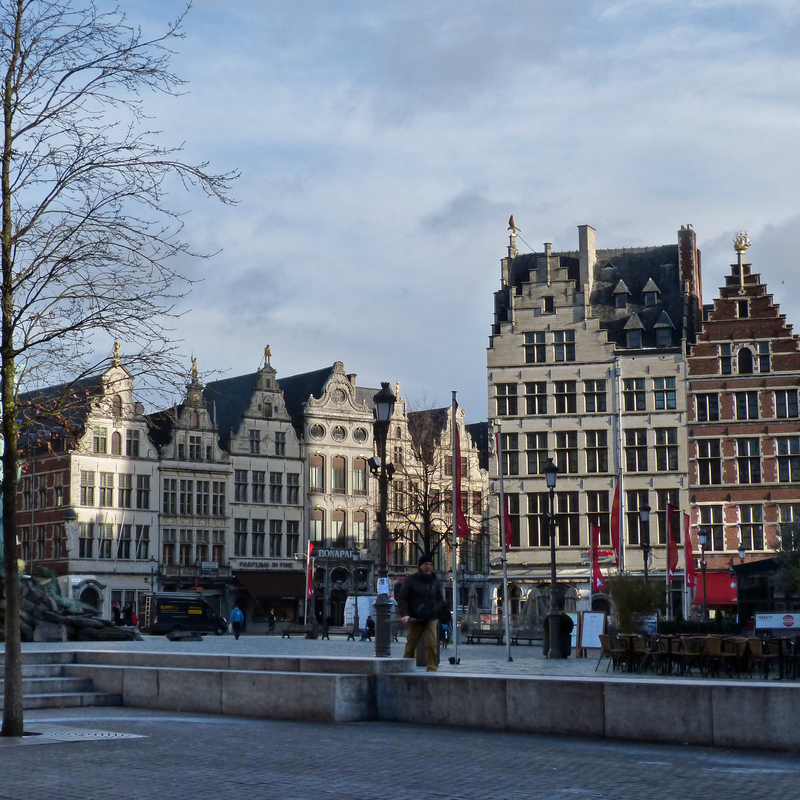 However, John Lothrop Motley argues, and so do a lot of Dutch etymologists and historians, that Antwerp’s name derives from an ‘t werf (on the wharf, in the same meaning as the current English wharf). You can read the complete explanations here if you like along with a history and description of the city: https://en.wikipedia.org/wiki/Antwerp. 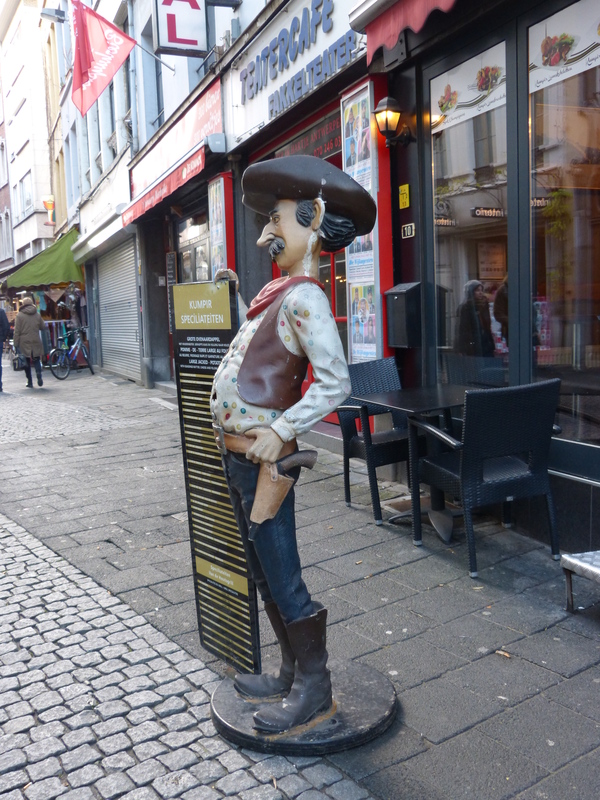 PS: I did find one other American in town. He’s shown above. Try to guess how I knew he was an American and enter you guess in the “Comments” section below. The right answer might win a prize! 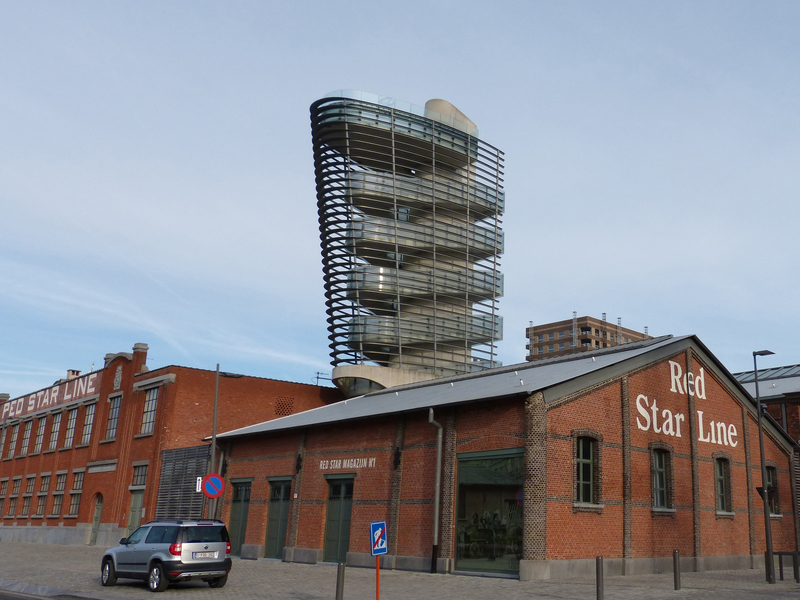 The newest in Antwerp, this museum is focused on emigration and particularly on the stories of the two million people who sailed on this steamship company’s ships when they left Europe for new lives in North America. 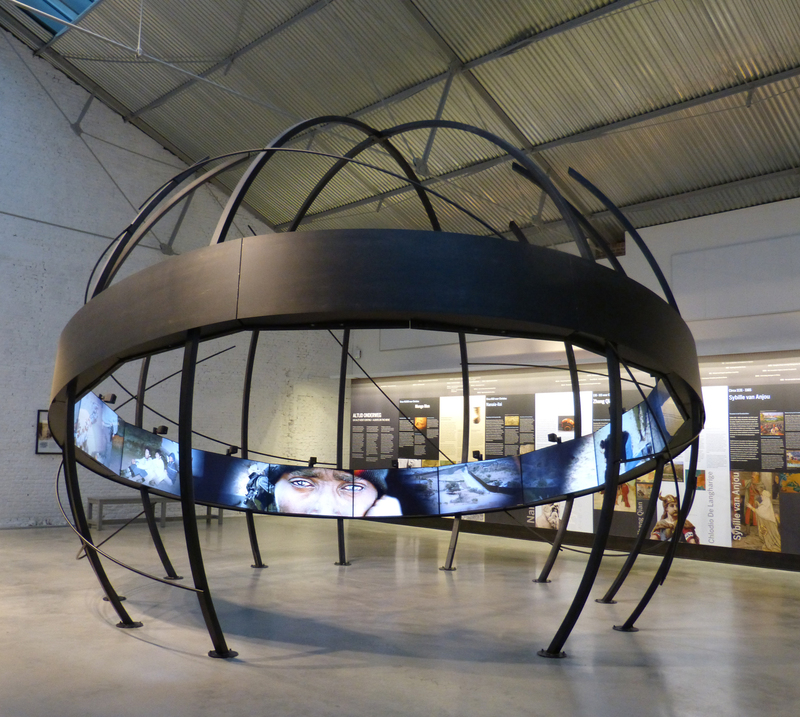 The museum is located in a warehouse of the port district of Antwerp. The building served as the ticket office, examination room and embarkation point of both first and second class passengers and those who traveled in steerage. For the most part the higher-paying passengers were going to the USA and Canada on business or for leisure travel. 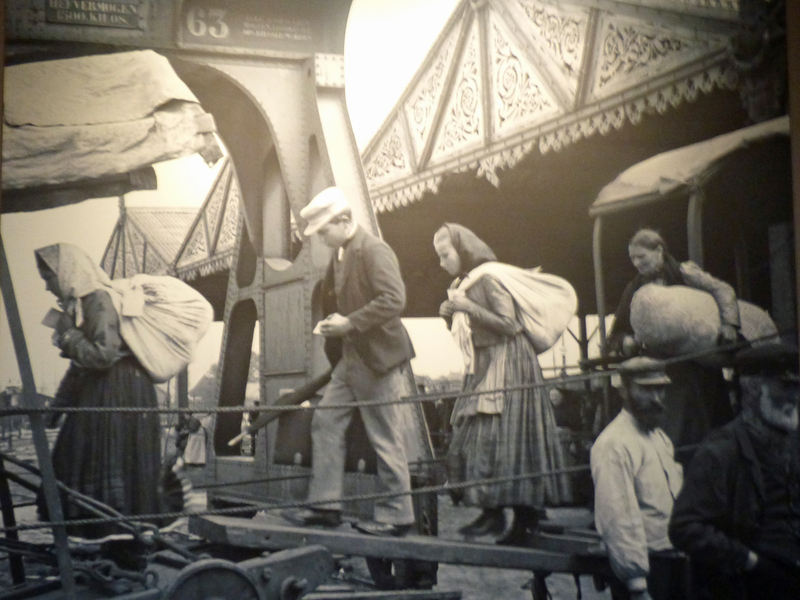 Those in steerage were intent on becoming new residents of the USA and Canada. The stark difference in the way in which these two classes were accommodated is highlighted. The creators of this museum worked for years pulling together many artifacts and stories of people who have sailed on Red Star Line ships. They found local support and sponsorship, renovated their building, and created a 21st century museum. The stories they tell are inspiring. Here are a few photos of the displayed objects. Displays of passengers’ photographs, letters, and written accounts fill most of the museum. We see photos of passengers, lists of their names and personal information, a first class stateroom, dining room menus, luggage and much more. First class passengers lived well in the upper decks of the ships. Here we see the more numerous steerage passengers headed to the new world with only what they could carry on their backs. It is explained that, before being allowed to board, steerage passengers were forced to endure invasive physical exams and their clothing was “sterilized” in huge steamers. 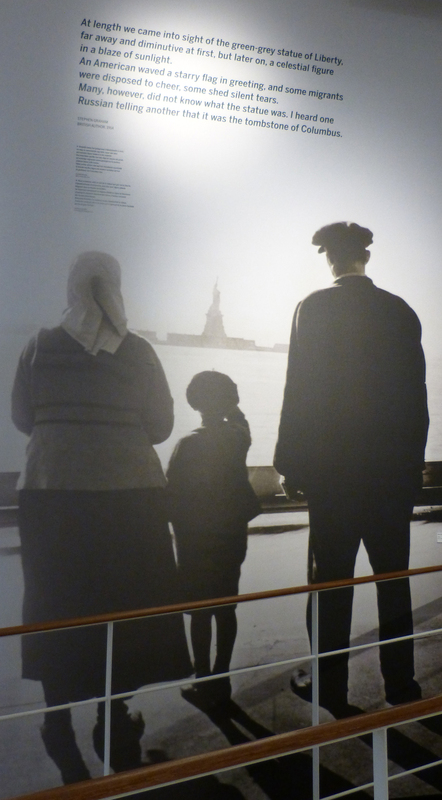 In this era emigrants to the United States were not required to have visas before departing but as many as two percent were rejected for health or character reasons and were sent back. 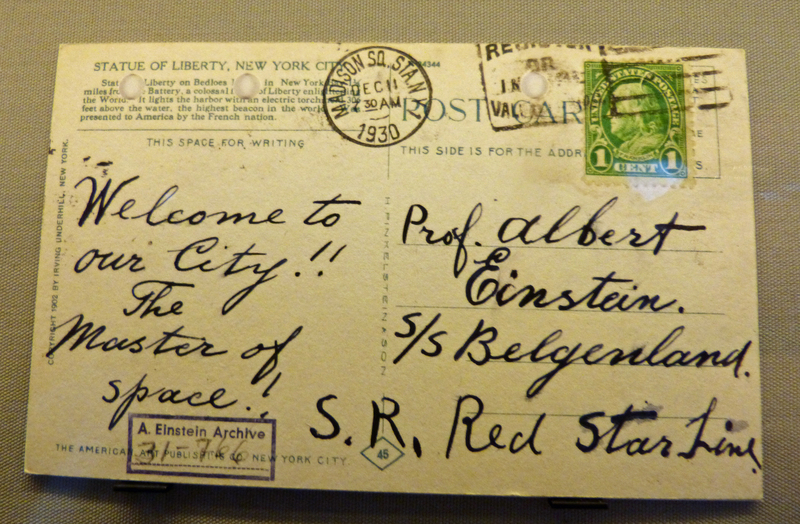 Albert Einstein sailed on Red Star Line ships twice, in 1930 and again in 1933. During his second trip Hitler came to power, and (being Jewish) he decided to remain in America. Here’s a fun reminder that’s on display. 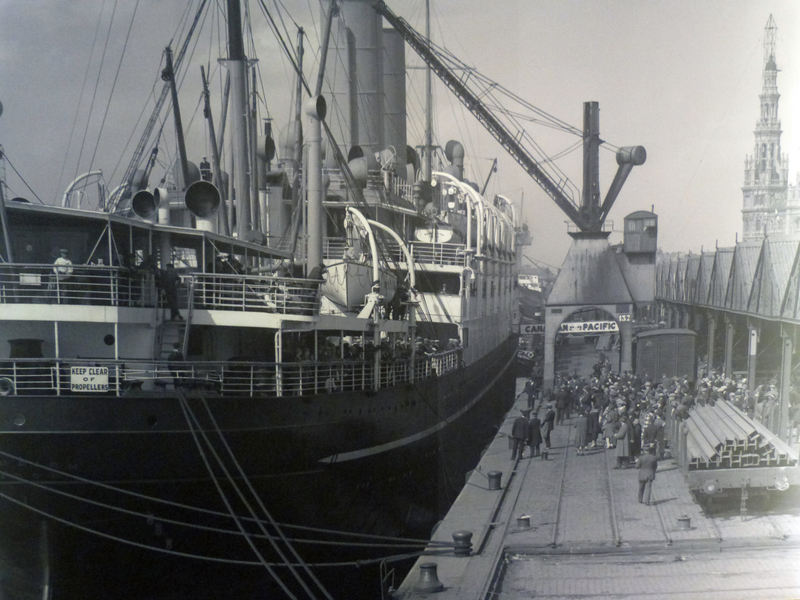 Here a Canada-bound ship is shown getting ready to sail. The ships were surely much smaller than those vacationers cruise on today. And here we see one family’s arrival in America. 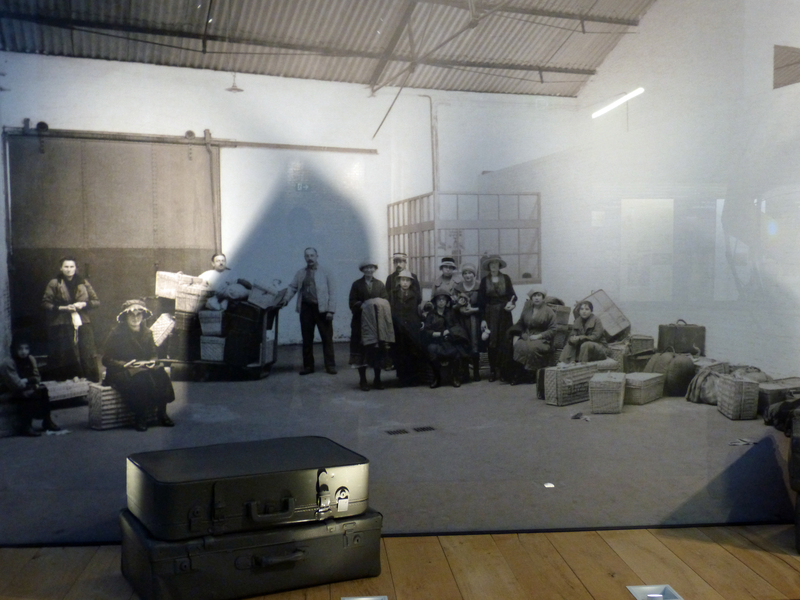 In a separate exhibit, one I think is temporary, the focus is on the history of emigration. Using a type of video display I’ve never encountered before, images of emigrants of yesterday and today flash on this unusual monitor. 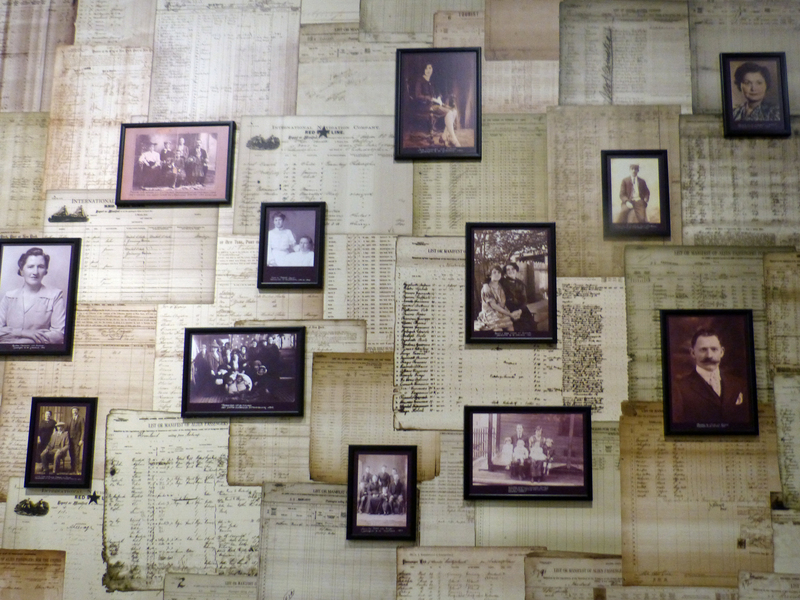 Along the walls large panels use stories and photographs to describe individual emigrants. The story of emigration begins with “Mungo man” who set off to find a new home 40,000 years ago and extends to the people in China who were forced by flooding to flee their homes in late 2015. 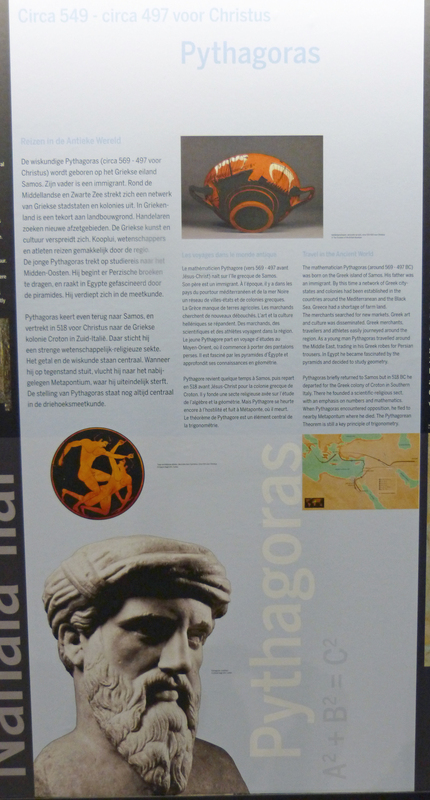 We learn about emigrants in Africa, China, ancient Greece, including Pythagoras. Moving forward in time we learn of a royal woman, Sybille of Anjou, who in the 12th century went to Jerusalem, accompanying her husband on one of the crusades, and became an emigrant when she refused to return with him to France. We learn about Elisabeth Vincent who, born into slavery in Haiti, fled as a child to Louisiana with her mother and became a free woman. 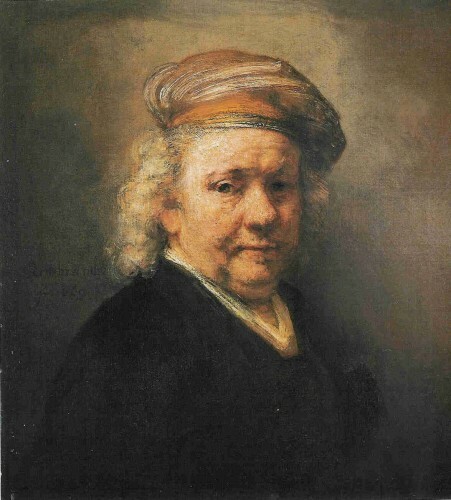 Years later she relocated to France with her husband before ultimately settling in Antwerp. A better known emigrant was Israel Beilin who emigrated to America with his family in 1893. An accomplished musician, he became well-known by another name, Irving Berlin. 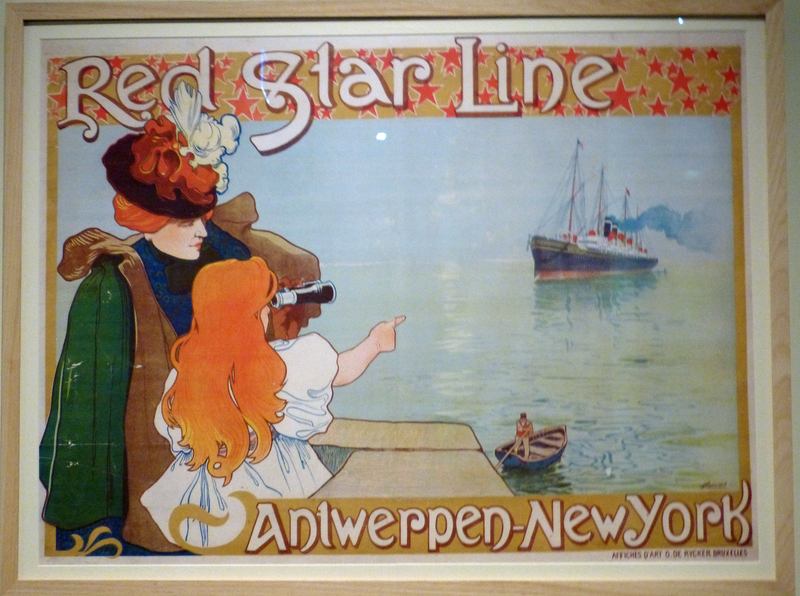 The stories told at Red Star Line Museum reflect the experiences of all our ancestors who moved from their homes and families to new places. It reminds us to appreciate the sacrifices they made so that we can enjoy the comfort and freedom we have today. This was my first view of Antwerp on arrival, the great hall of the railway station. 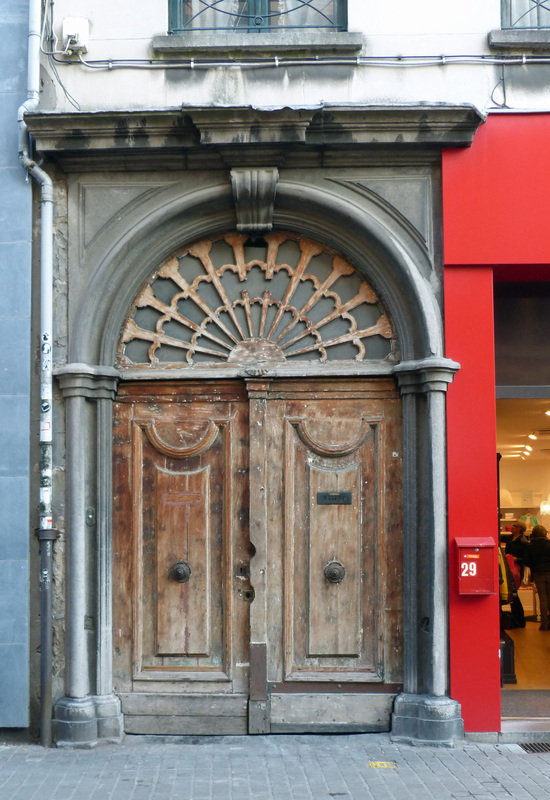 As would be expected in a city with a long, important and colorful past, history is everywhere in Antwerp! On Saturday I experienced two of the most important pieces of the city’s history, but just walking around this city’s streets allows a visitor to find history everywhere. For example, the central train station, built between 1895 and 1905, is an enormous structure crowned by a large dome. 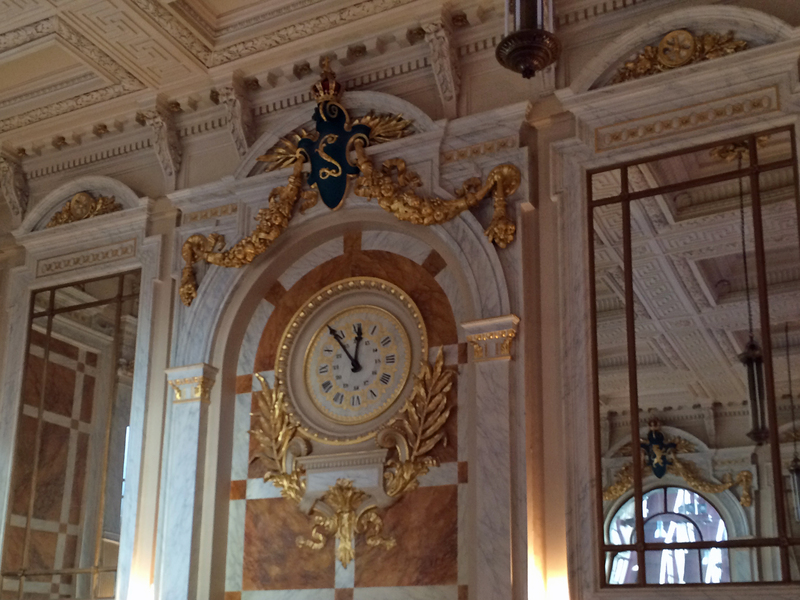 The walls of the grand entrance and lobby are covered in marble – the space is so rich that I was reminded of St. Peter’s Basilica in Rome. I’ll use my picture here but clicking this link will show you several much better photos at Wikipedia. 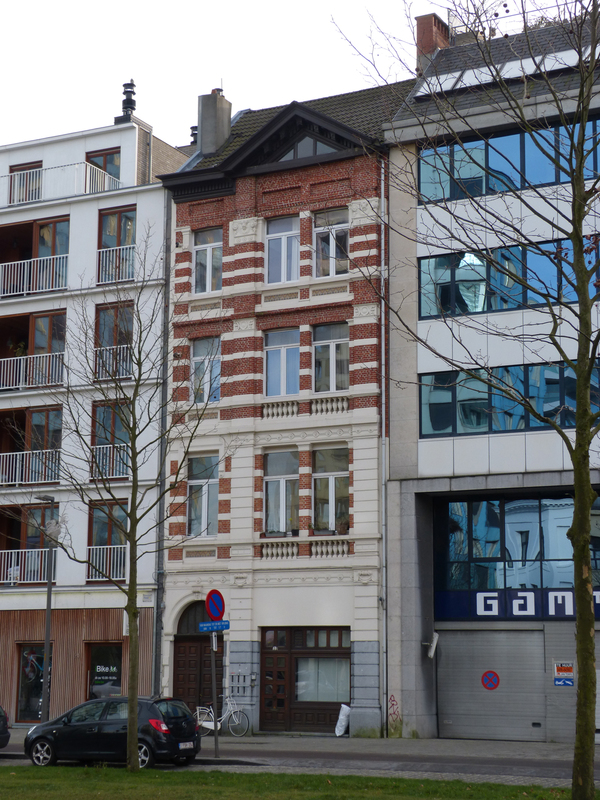 The primary business and retail avenue of Antwerp begins at the station. A matched pair of elegant buildings stand proudly at the entrance to the Meir, as the street is called. They set the tone for the blocks ahead. Familiar names from the U.S. and Europe are found here but of much greater interest to me were the magnificent office buildings of the early 1900s. The building that I liked best featured this angel holding lightning bolts. I’m guessing – though it’s only my guess – that this must have been the headquarters of the electric, telegraph or telephone company. The building takes an entire block, is very rich and elegant and its entrance features a dome. 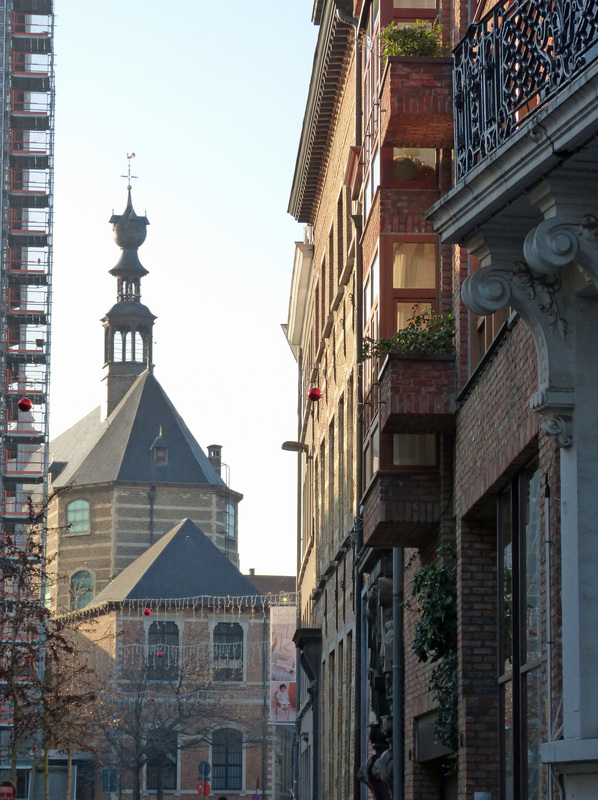 One of the most notable buildings on this street is Europe’s first skyscraper. 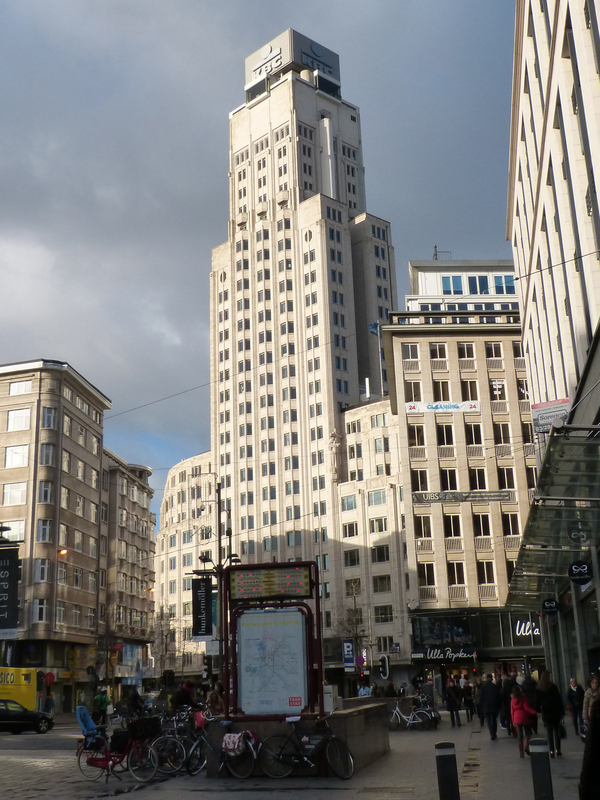 Built between 1929 and 1932 in the “New York style,” the building is called Boerentoren which means the farmer’s tower. At 287 feet tall, it was the tallest building in Europe until 1940. 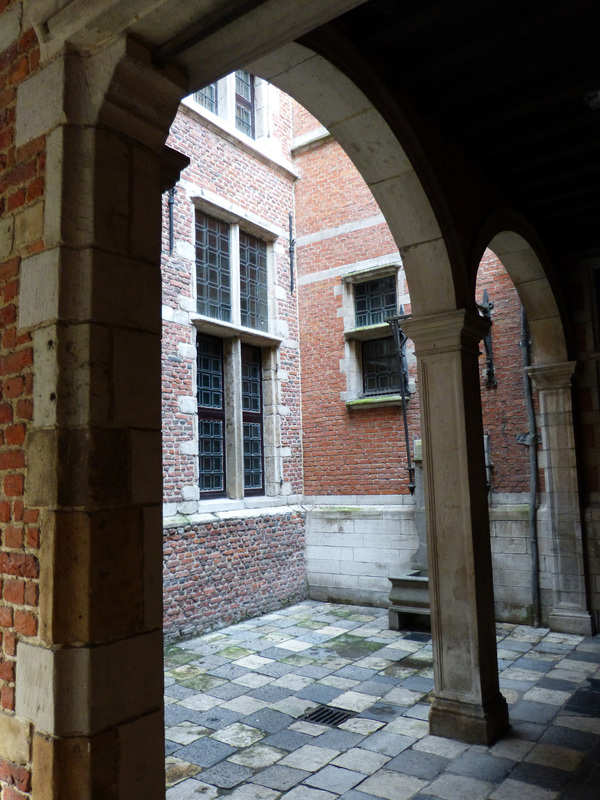 When I reached the center of the old town I went to one of the oldest museums in Antwerp, the Museum Plantin-Moretus. 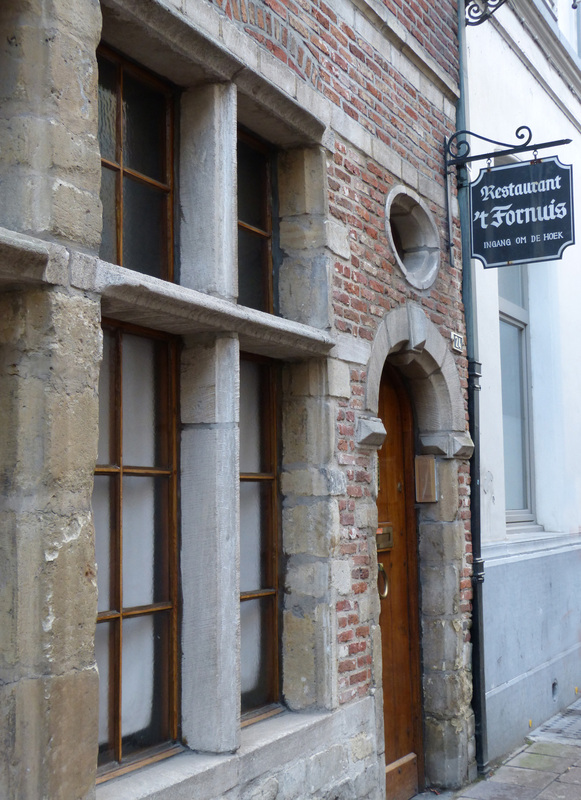 The buildings of this museum were the home and the workshop of an early printer, Christophe Plantin. 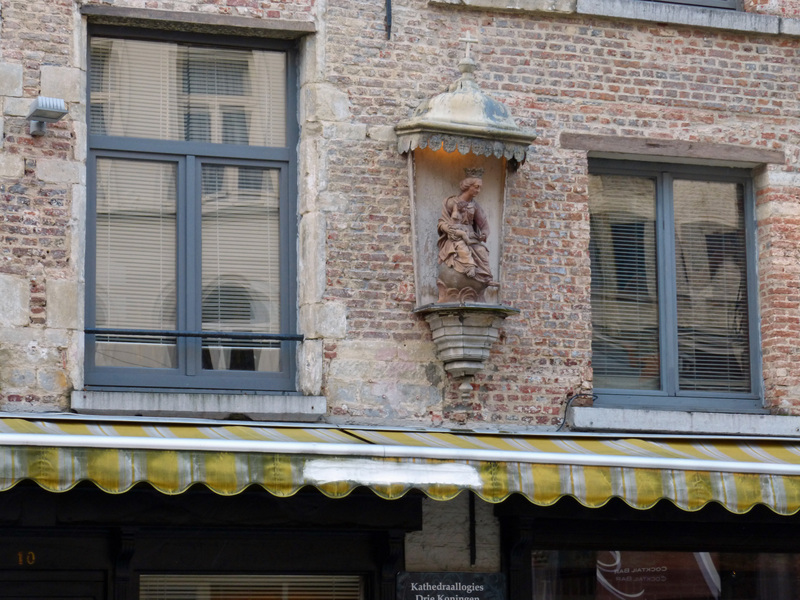 He opened a shop here before 1568 when he printed a Bible in five languages. 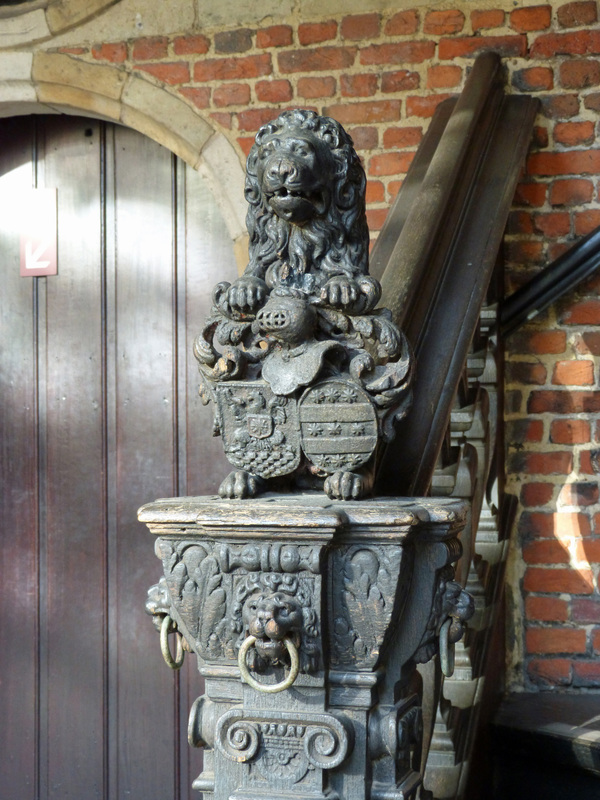 His is considered to be the world’s first “industrial” printing works. His company was inherited by his son-in-law, Jan Moretus. 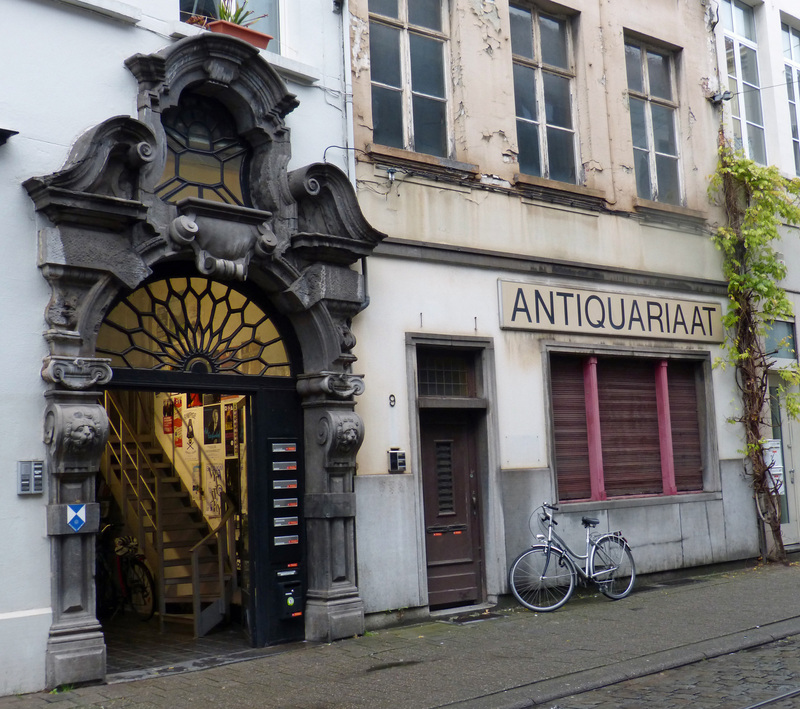 The publishing house and the home were continuously in the possession of the Moretus family until 1876 when they are sold to the City of Antwerp. The museum is a perfectly preserved 16th century upper-class home that displays many very old books. More importantly it is a rare view of very old type-cutting, type-setting and printing techniques. I have created a separate page to give you a better description. Please click here to see it. Can you see all the golden statues that were shining in the sunlight? As I was walking along the street on this very sunny day, a ray of pure gold caught my attention. At the end of a short, narrow street there was a beautiful church with several golden statues adorning its façade. I wasn’t the only one to be caught by this lovely sight – every tourist passing by lined up in the alley to take a picture. I’d found the church of St. Charles Borromeo. When I entered it I discovered a church much in the style of churches in Italy. It was very beautiful. The interior of St. Charles Borromeo church. 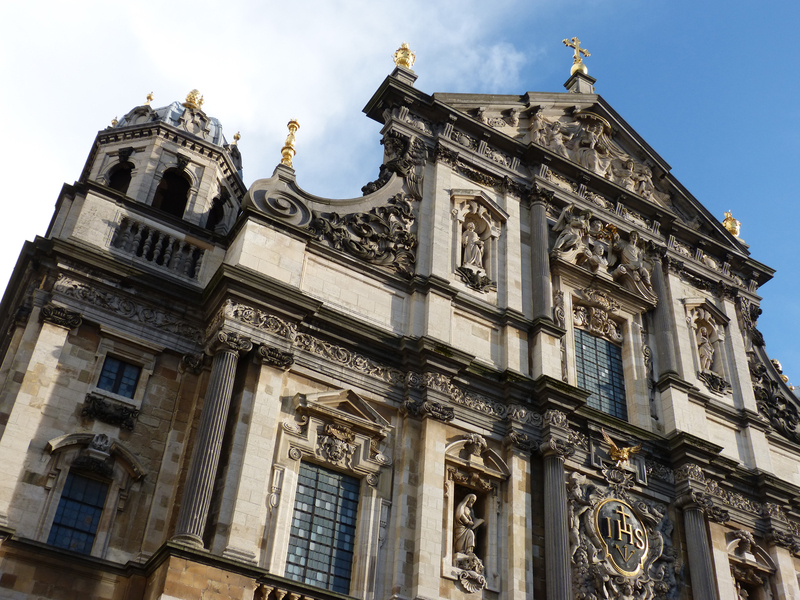 Finally I went to the Cathedral of Our Lady in Antwerp. My husband loved to visit old churches and cathedrals when we traveled and he taught me to love them to. 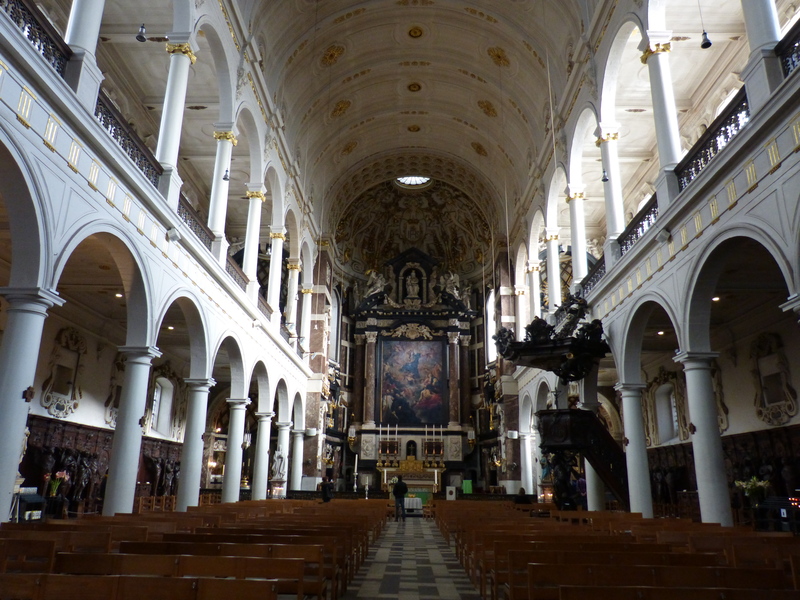 We have been to most of the famous cathedrals of Europe and to many not-so-famous churches as well. I can say without exaggerating that this is truly one of the most beautiful I have seen. Again, there’s so much to show you that I created a separate page – click here. By Sunday morning I was feeling the effects of a head cold and the temperature had dropped to the lowest point of my trip to date. Today it’s even colder but my cold is improved. I’ll venture out in a while to find something new to show you, but for now please click on the links above to see more of the two ancient sites I enjoyed. 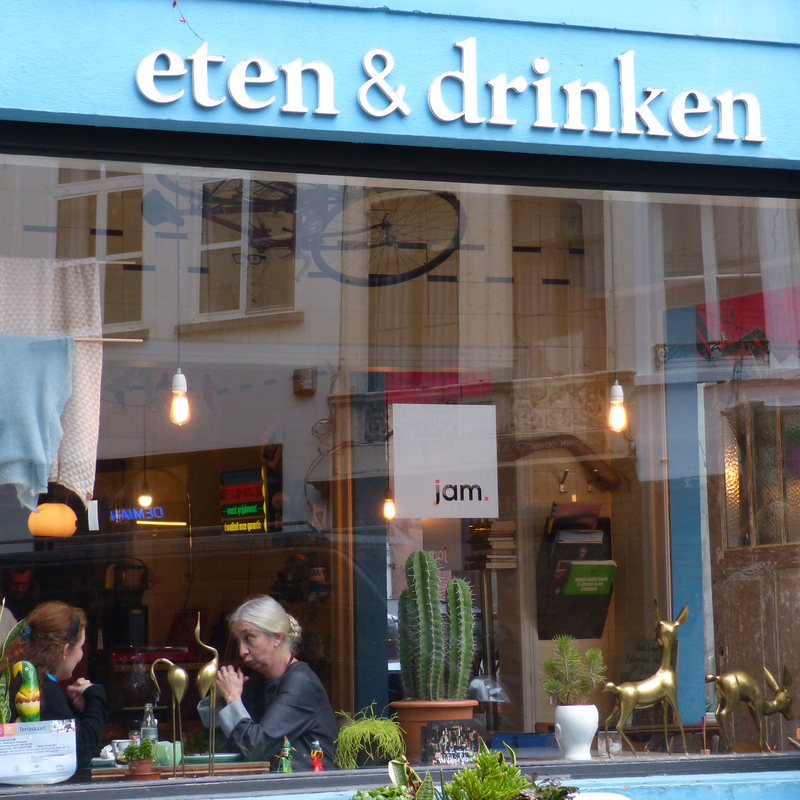 Antwerp is a very cool town! 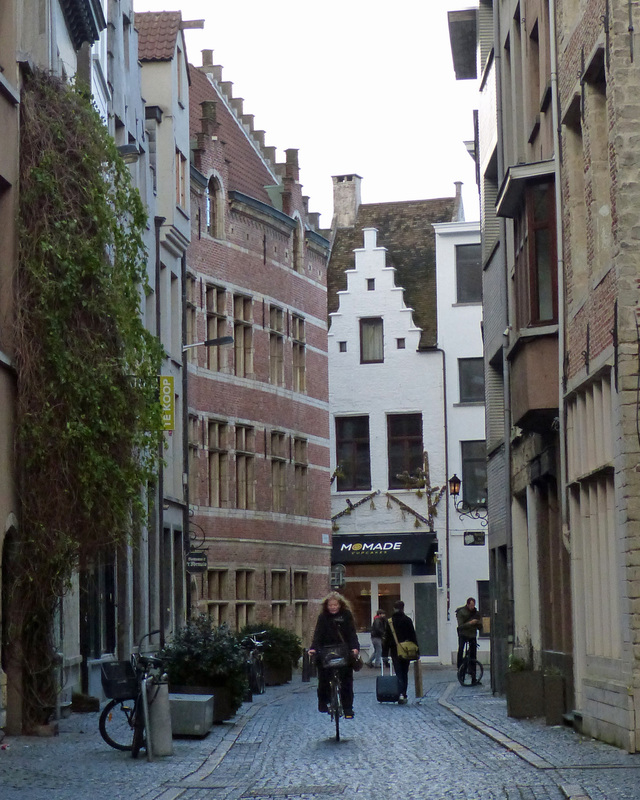 The 16th century street I found today in Antwerp. There are a great many good restaurants, and the prices are great! The city’s leadership is obviously forward-looking and has been for some time. So, in case you’re wondering why I have written these things, let me explain the good day I had in the cold rain today. The people are very friendly. While eating lunch today I noticed across the street a doorway in a very old building leading into what appeared to be a courtyard. When I asked a young man standing there if I could enter he very enthusiastically said, “Yes! This is a 16th century street.” The picture at the top of this post shows what I found. These old guild hall buildings surrounding the central market square in Antwerp are definitely not the only beautiful old buildings her. The 21st century architecture is exciting. There’s a new 10 story museum in the revitalized port area. I think it illustrates my point very well but it’s certainly not the only creative modern architecture in town. There are a great many good restaurants, and the prices are great! Let me tell you about the lunch I had today! It was in an Italian restaurant employing only people from Italy. I ordered cannelloni and it was the best I’ve ever had. It was a large dish, about twice as much as I could eat. I also spontaneously ordered a glass of red wine. I almost never drink at lunch (especially when I’m alone) and I really don’t like red wine, but it seemed just right with the ambience and my choice of food. It was good and it cost $2.75. The total bill was under $13. The city’s leadership is obviously forward-looking and has been for some time. I say this based on the two new museums I visited today and the great changes going on in this old port section of town. I’ll write about the museums on another day but I’m excited about what I found. I’ve shown you the MAS (Museum aan de Stroom) building. The interior is just as cool and has a number of innovative programs. I also went to the Red Star Line Museum this morning. Its subject is emigration in general and the great wave of migration from Europe to North America, It’s focus is also as up-to-the-minute as the wave of people who fled floods in China last month. 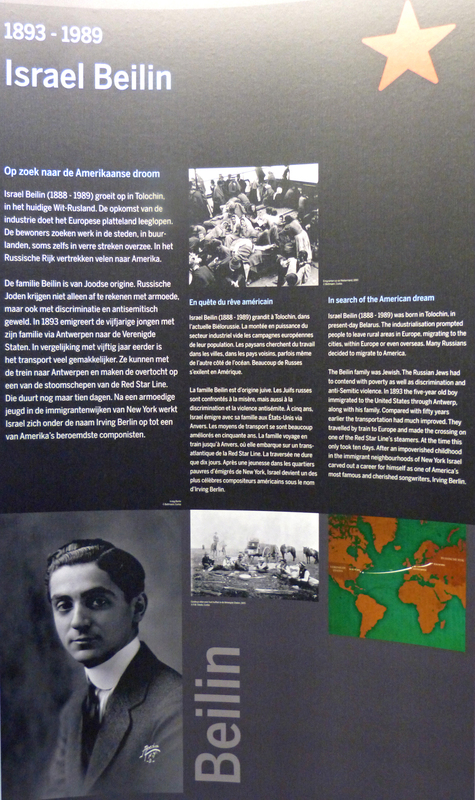 More to come about my two museum days in Antwerp soon.